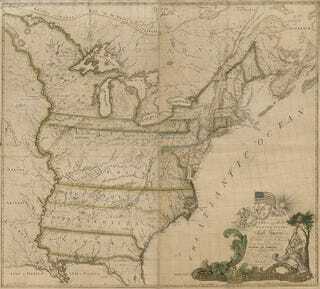 Engraver Abel Buell came out of nowhere, at least in terms of cartography, when he printed a United States map in 1784. "He'd never done a map before," says Edward Redmond of the Library of Congress' Geography and Map Division. Nonetheless, Buell set records. He was the first U.S. citizen to print a map of the United States in the United States after the Treaty of Paris was signed on September 3, 1783. The treaty formally concluded the American Revolution and recognized the United States as an independent nation. Buell was also the first person to copyright a map in the United States. Buell's "New and Correct Map of the United States of North America" is the centerpiece of Mapping a New Nation, an ongoing exhibition in the Thomas Jefferson Building of the Library of Congress. Philanthropist David M. Rubenstein purchased Buell's map at auction in 2010 and made it available for public display at the Library. Buell's map documents a unique time in U.S. history. "Before adoption of the Constitution in 1787, the federal government couldn't establish boundaries between states or force surrender of the western lands some states claimed," Redmond notes. "As a result, the boundaries of many states in Buell's map extend west from the Atlantic Coast all the way to the Mississippi River." Lawrence Wroth, Buell's biographer, described Buell as creative and versatile but also restless and impulsive, which perhaps explains his conviction in 1764 for counterfeiting. Buell served jail time, had the tip of his ear cut off, and had his forehead branded with the letter C, a standard penalty of the time. His colorful life notwithstanding, Buell had the skill and wherewithal to create his own "cartographic conception of the United States," rich in symbolism of the emerging nation, Redmond concludes.